The Malawi National Examination Board (MANEB) has disowned a circular hovering on the social media that the 2018 Malawi School Certificate of Education (MSCE) will be re-written citing cheating as the main reason. 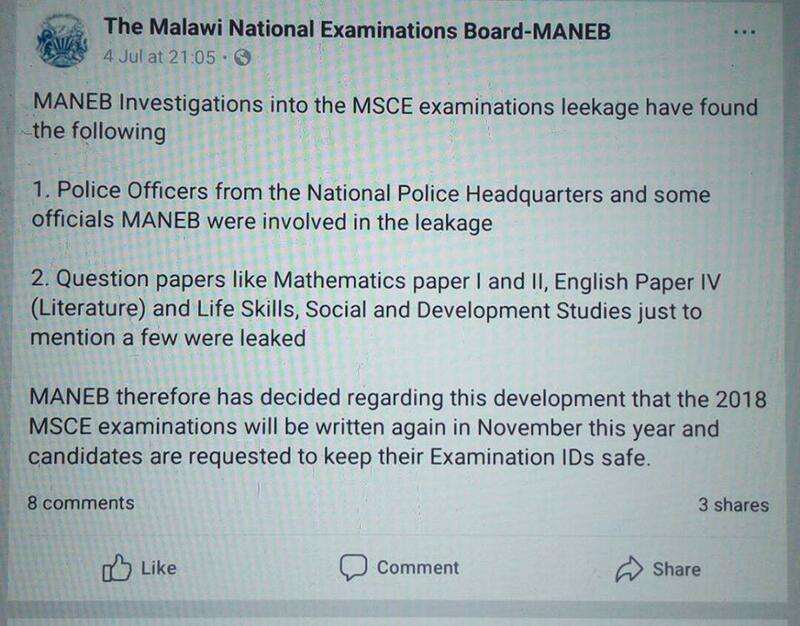 The social media on Thursday was awash with a circular purportedly issued by MANEB blaming the National Police Headquarters of leaking 2018 MSCE examinations currently underway in most Secondary Schools in the country. Some of the papers reported to be been leaked by the police include; Mathematics Paper I and II, English Paper IV (Literature), Life Skills and Social and Development Studies. “MANEB therefore has decided regarding this development that the 2018 MSCE examinations will be written again in November this year and candidates are requested to keep their examination IDs safe,” read in part the circular. But speaking in an interview with the press MANEB Public Relations Officer Mayamiko Chiwaya disowned the circular, describing it as fake. When asked as to whether there is leakage in examinations, Chiwaya refused to comment by saying MANEB is investigating the matter. Reports gathered by this publication indicate that 2018 examinations have been leaked.